The road from the Clock Tower to Picture Palace has changed dramatically. There are now tiny shops all the way with only a few breaks. 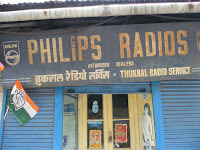 One sad storefront is Thukral’s old shop. He was the school photographer for many years. A few years ago when we visited, Mrs. Thukral could be seen sitting on the stoop in a chair in the sun. It now appears completely closed. Kulri is a tourist area, packed with cars and people, especially now in "the season." It also has many restaurants. The first one we ever ate at in 1968 was Neelam’s, with Diana Biswas. She introduced us to one of their signature dishes, Simla Mirch (stuffed green peppers). When we were there on Easter weekend we had it again in memory of her. The filthy curtain near the sink that everyone used to dry hands is gone (a good thing!). There used to be a small poori shop across the alley and below the other shops, but it is long gone. Now Agarwal’s across from the Inder Bengali Sweet Shop is where we go for poories (and Inder's still has the best rasgullah). At the top of Kulri hill many businesses have been in the same location for years. Bata Shoes, the Kashmiri shop, Chic Chocolate and Bee Kay Opticians were all places we shopped long ago. 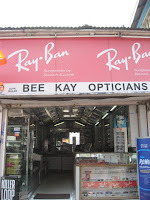 Dan got a new pair of glasses at Bee Kay last month, and we always have to pick up a few Kashmiri things at that store. The Kwality restaurant at the top of Kulri hill near Hamer’s and the old Rialto Cinema was a landmark, one of the few places a female could count on finding a place to relieve herself. 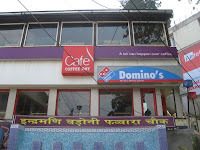 Now the first floor is a Domino’s Pizza and the upper floor a Coffee Café Day. Hamer’s is still open but the cinema is long closed. 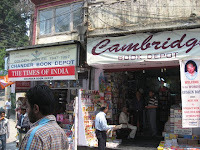 We are always looking for more books and the two bookshops in Mussoorie are right next to each other, Chander and Cambridge. Cambridge Book Depot has just undergone renovations. Both of them are packed with bookshelves and piles of books, mostly English paperbacks, Indian, American and English. Cambridge has a good display of Mussoorie writers in the front section. Their magazines and newspapers are right out on the front stoop. i loved reading this post. i only wish you had written more. if you have more writings on Mussoorie please do write more. There used to be a KING PHOTO STUDIO in KULRI opposite the BENGALI SWEETS Shop. I don't know if that shop still exists. But why don't you contact Wynberg-Allen School at wynbergallen.com and see if their alumni office can help you get in touch with your friend.